This event is posted on GC.com, but is waiting for me to release it. I thought I would give everyone advance notice to prepare for it. Easy to find. Just follow the GPS until you get within about 75 feet and you should be in front of the house. Come between noon and 1 pm and stay as long as you like. 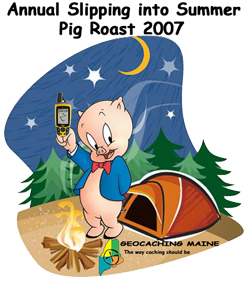 This caching event will be to try and get Maine geocachers together. We know it is hard for the Maine cachers in southern Maine area to make it to the cache events in the Bangor area. So we are making an effort to help them make this event. We are trying something different this year. We are making this a pig roast. So come hungry. We will be roasting a whole pig on a rotisserie through out the morning for the afternoon event. We have a grill for those that would like to bring there own food to cook. We have a fairly large back yard. We can set up a slip and slide on the small hill in the back yard for the children or adults. We did this last year at the event and it was a big success and will do it again this year as long as the weather is permiting and as long as the well pump holds out. We will have a canopy tent ready to set up in case of rain. If the weather does look back we can also set up a large covered tarp area. But we don’t not want to think about the four letter word “rain”. We have already added two new close caches in the area so they can be found before or after this event and left for future caching. If you want to get here earlier and head out for some local caching then you can stop off here first and leave what you don’t want to carry around in your car. We can also set up an area if someone wants to tent here for the night. If we get some tenters as we have in the past we will have a fire in the fire pit at night if it is not too windy. If you want to you can tent for the night and use our home as home base if you want to do some more caching the next day. If anyone is interested in bringing a tent and making this an overnight event just let us know we have plenty of room. We would just like to have a head count for those wanting to spend the night. We will be having some type of breakfast the following morning so a head count would help. We are also only one mile away from a bunch of lakes. There is a bridge just down the road that the local kids and adults use to jump from. It is only about 10 feet off the water. For those that are interested I have a wireless router that can be turned on if they want to bring there laptops. I have moved the router so that the wireless connection will work better then what it did the last event. 1. You and anyone interested in attending. 2. The food that you want to eat. 3. Chairs to sit in. 6. Tent and sleeping gear if you plan on spending the night. 7. If you have an extra grill it might help. 8. Travel bugs to pass along. For anyone camping out for the night we will have a breakfast I in the morning. Consisting of pancakes and eggs and Orange Juice. We can make instant coffee. If someone brings a coffee maker then we can make real coffee. A head count for those spending the night would be nice. Please leave me email or post it here. Any side dish you like to share. Salads ie patatoe, macaroni, toss, pasta. One more note to add to this. We will be selling T-shirts with the following image on the shirt to help offset the cost of the event and the pig and the cooker soon. We are trying to determine a reasonable price for the shirt. Were thinking $10 each. So if anyone is interested in a shirt them PM me your size and how many you want and I will send you my paypal account to send the money to. We will not be ordering any extras, so if you do not order it before we send out our order then you will be out of luck. Here is the image that will be on the shirt. Team Teebow will be there for the day. Unable to kayak the nexy day. Let us know if you need any help with getting that pig started. We are interested in t-shirts also. Could you give us a rundown on sizes? Sizes will be M, L, XL, 2XL, 3XL. I will need to check but I am pretty sure Small is available too. .....If someone brings a coffee maker then we can make real coffee. A head count for those spending the night would be nice. Please leave me email or post it here. This sounds like a fun event . I wouldn't miss it. I also plan on camping and going on the kayak run on Sunday and will bring my kayak. and I have a 10 cup camp coffee percolator I can bring along if we want real coffee in the morning. Maybe a Tofu dish would get Jake to an event! btw, you can count me and stef for overnighters again. Uh . . . thanks for the thought, but I don't usually do events since I'm not much of a social butterfly like Hiram is (seriously . . . I was going geocaching with him one time and I pull in the parking lot where I was meeting him and he was chatting with this guy as if they were long lost friends -- turns out he only met the guy 5 minutes before I arrived) . . . I'm more like a lunar moth. I've actually had tofu . . . and it wasn't bad . . . but all in all I think I'll stick with a good medium rare rib-eye or T-bone steak . . . although that roasted pig sounds pretty good . . . just not good enough to lure me to an event.